Rs 500 & Rs 1,000 Currency Notes banned! How to exchange old Notes? You are here: Home / Banking / Rs 500 & Rs 1,000 Currency Notes Banned : What is the impact? How to exchange old Bank notes? Rs 500 & Rs 1,000 Currency Notes Banned : What is the impact? How to exchange old Bank notes? In India, more than 1/3 of the money that is in circulation is in the form of Rs 500 & Rs 1,000 currency notes. The incidence of fake currency circulation and usage of high denomination notes for illegal activities has been increasing for the last many years. In a move to curb the rising incidence of fake notes and black-money menace, the Indian government has declared that currency notes of Rs 1,000 & Rs 500 will not be legal tender from 9th November, 2016. Newly designed Rs 500 note and new notes for Rs 2,000 will be brought into circulation. The public can exchange the notes in the next 50 days (10th Nov to 30th Dec, 2016) in any Bank or Post office branch. In this post, let’s understand – How to exchange the existing Rs 500 & Rs 1000 currency notes in Banks or Post office branches? What are the withdrawal limits that are imposed over the next few weeks? What would be the impact of banning high denomination currency notes? High Denomination Notes Banned – What is the impact over the next few weeks? 9th November – The existing Rs 500 & Rs 1,000 currency notes won’t be usable from 9th November, 2016. 9th November – Banks & ATM machines will not be available for public. 10th November – Banks will be open for public works. ATMs in some places might not function. 11th November – All ATMs will be available for the public. 10th Nov to 30th Dec – Banks & post office will accept money exchanges. Till 30th Dec – RBI waives charges on ATM transactions for all banks till December 30th, 2016. 31st Dec, 2016 to 31st March, 2017 – People who possess Rs.500 or Rs. 1000 currency notes after December 30 can exchange them at Reserve Bank of India centres only. Ticket booking counters of Railways, Govt buses and Airlines ticket counters at Airports will accept the Rs 500& Rs 1,000 currency notes. The notes are also accepted at Petrol, diesel & gas stations, milk booths authorized by State Governments. You can use old high denomination notes to pay Toll-Gate fees, LPG refill bookings, Electricity & Water bills, Court Fees & Govt taxes. How to exchange old Rs 500 & Rs 1000 Currency notes? What are the limits on Withdrawals? Is there any limit on Cash Swap? – You can exchange your high denomination notes up to Rs 4000 per person in cash. Beyond this limit, the amount has to be deposited in bank account. 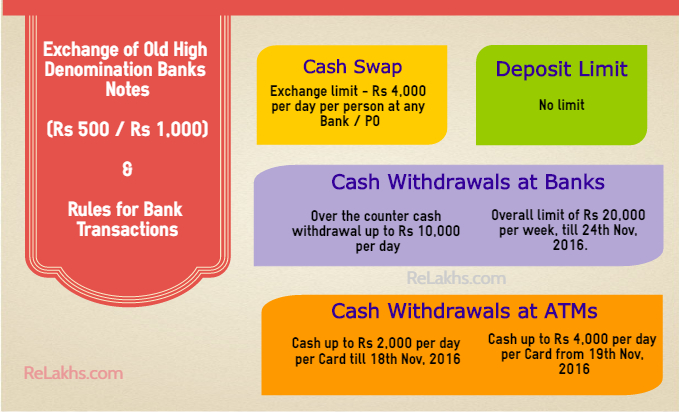 For exchange upto Rs 4,000 in cash (revised to Rs 2,000) you may go to any bank branch. You have to provide a valid ID proof. If you want to exchange over Rs 4,000 then you have to visit the bank branch (home branch) where you have an account. You can also exchange the notes at any other branch of the same bank. In case you are exchanging in a bank branch of any other bank where you are not maintaining an account, you will have to furnish valid identity proof and your bank account details. The respective bank will do electronic fund transfer to your bank account. What is accepted as Valid ID Proof at the bank? – You can provide any of these ID proofs : Aadhaar Card, Driving License, Voter ID Card, Pass Port, NREGA Card, PAN Card, Identity Card Issued by Government Department, Public Sector Unit to its Staff. Can I deposit old high denomination notes through ATMs? – Yes, the old notes can be deposited in Cash Deposits machines / Cash Recyclers. I do not have bank account, can I use my Friend’s or Relative’s bank account? – Yes, this is acceptable. Your relative or friend (account holder) has to give you permission in writing. While exchanging the notes at the bank where your friend has an account, you should provide to the bank – the evidence of permission given by the account holder and your valid identity proof. How much amount can I withdraw from ATM? – The ATMs are going to be functional from 11th November, 2016. you can withdraw from ATMs upto a maximum of Rs.2,000/- per card per day (revised to Rs 2,500) upto 18th November, 2016. The limit will be raised to Rs.4000/- per day per card from 19th November 2016 onwards. How much cash can I withdraw at the Bank? – Cash withdrawals from bank accounts (or) over the bank counters, will be restricted to a limited amount of Rs 10,000 per day subject to an overall limit of Rs 20,000 a week (revised to Rs 25,000 & daily limit of Rs 10k has been removed) from November 9, 2016 till end of business on November 24, 2016. The limits will be reviewed after this. Can I make online money transfers through my Bank account without any limit? – Yes, the money available in your bank accounts can be freely used by issue of cheques or by remitting through various electronic modes of transfer like NEFT, RTGS, IMPS, mobile banking, internet banking etc. If you have high denomination bank notes in India, you can authorize your representative in India in writing. He/she can deposit your notes into your bank account. Your representative has to submit the authorization letter & his/her valid ID proof to your bank account along with the bank notes. Below is the ‘Cash Exchange’ request slip that has to be submitted along withe old Bank notes. Kindly click on the image to open it in a new browser window. Cash deposits of Rs 2.5 Lakh and above made during the 50 day window period (10th Nov to 30th Dec, 2016), could attract income tax plus a 200% penalty in case of income mismatch. Govt has requested all banks & Post offices to furnish the reports of all cash deposited during this period, above a threshold of Rs 2.5 Lakh in every account. This is limit is Rs 12.5 Lakh in case of a Current Account. Cash withdrawals of up to Rs 2.5 Lakh can be made fro marriage purpose from the KYC compliant bank account. This bold decision by the Govt will certainly have its impact on all our lives. In short-term, if you have to deal with or make any cash payments then you are going to face some hardships over the next few weeks. As mentioned above, more than 1/3rd of bank notes which are in circulation are high denomination bank notes only. So, it might take some time for the RBI to print and make the new notes available to the public. If less money is available, this can impact the purchasing power in the short-term, this can lead to low levels of Inflation. The sectors like Real estate (especially the un-organized segment) , Bullion market, Consumer goods, automobiles, infrastructure etc., will have negative impact in short-term. The property prices might come down but I believe that once the dust settles down, the construction activities can pick-up when the middle class families start buying properties (if they are available at affordable prices). We all know that lot of cash is used for Health-care treatments, Higher Education expenses, buying Properties, luxury products, Gold ornaments, exchange of Agricultural produce etc., The non-availability of high denomination notes can have huge impact on these transactions. Lot of cash (white or black money) gets invested in Chit funds, especially in towns and rural areas. So, these companies may now have to do business in a ethical and legal way (or) have to close their businesses altogether. I believe that less number of cash transactions will take place in the long-run and this is good for the entire economy. More Indian families will come into the hold of banking system. Wasteful expenditures & corruption can come down. We need to do our bit by educating the less privileged member of the society like your house-maids, sabjiwala, driver etc., about the money-exchange scheme. If possible, accept their Rs 500 & Rs 1000 bank notes and re-pay them in low denomination bank notes for time-being. This bold decision might actually create a havoc in the short-term. The un-organized players across different industries will feel the heat and will help them get organized. More number of organized players results in more tax revenue for the Govt. Whether this move will eradicate the entire Black-money present in our economy. May be or may not be. But, the existing hoards of black or un-accounted money has been made useless overnight, which is good for the economy! Whether this move will stop creating black-money over the next few years? – Govt is going to launch new high denomination notes again, so cash (legitimate or illegitimate) may pile up again. So, this kind of demonetization has to be done periodically. These kind of reforms related to Currency / taxes should be done on a continuous basis. Let’s hope we are moving towards the ‘Cashless Economy’ in the longer run and this is a step in the right direction! Kindly share your views and comments. 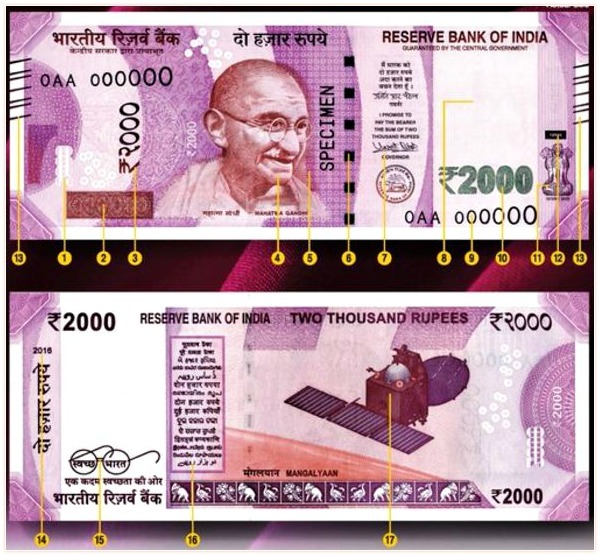 Continue reading : RBI introduces new 500 & 2000 Rupee Bank Notes with advanced features – How to identify new 2000 & new 500 Rupee Bank Notes? Dear ashwin ..You have to visit nearest RBI office and try exchanging the old high denomination notes. I have old currency with 5000. How can i exchange after dec 30 2016? i am a normal citizen. Dear srikanth . You can get them exchanged at RBI centres only. My Mother having savings of worth 3 lakhs which she earned for past 10 years by lending money for interest nearby place in my hometown. But she is not paying tax and also not having PAN card. I have opened bank account for my Mother but bank accepting only 49000 since she is not having PAN. Dear Marimuthu..You may kindly get her a PAN. Please advise if i should make any change or remain invested. Investments is done vide monthly SIP and has started 1 year ago. May I know what do you mean by SAFER? All the three funds are good ones. What is your investment objective & time-frame? I am doing retail and distribution business in hardware and paints. Shall i accept OHD currencies from my dealers’/customers for their outstanding balance as on 8-Nov-2016, if yes can i deposit that amount into my firm’s OD account? Suggest you not to accept the OHD as your business does not fall under the ‘exemption list’. You may request them to do online transfers instead. Thanks sreekanth, what is the limit for deposit OHD currency in OD/CURRENT ACCOUNT? Dear BALAJI ..There is no limit as such for depositing the amount in Bank accounts. I want to know if there is RTGS of more than 2.5 lakhs to one’s saving account, is there any problem ? Dear Deepak…No problem..you can do RTGS transfer..
As per the latest news, I believe that pre-closure of loans of Rs 50,000 or more can be reported by the banks/lending institutions to the IT dept. Your in-laws my have to Gift these amounts with proper documentation and you may then use these monies to close your loans. But kindly note that in-case if you receive any compliance notice from the IT dept, you may have to justify your stand. Now you can get 24,000 per week in all private sector bank like axis bank and ICICI bank. But Still you can get only 4,000 per day. I am an ardent follower of your blog. I want to invest 4-5 lacs for 2-4 year time horizon.whether I invest this amount as lumpsum in one fund or should I break in 2-3 parts. Plz tell me which funds should be best. Wait for your prompt reply. Disclaimer: I am just another user of this forum and have learnt a lot from Sreekanth. Above are just my opinions. What do you feel? will it effect USD/INR rates & real estate and in which direction it will effect? I believe this is just demonetization, currency is being replaced. So, no impact may be there on INR Vs Dollar rates. However, this may lead to rate cuts by RBI over the next few Quarters due to lower inflation rates. This may have an impact. Short-term : Negative to real-estate property prices. If the corpus that you have saved is from your income then kindly do not worry to deposit it in your bank account(s). Also, you have stated that you have been filing your ITRs regularly, so this should not be an issue at all. Also in future do not save via cash at home. Neither it is safe nor it gains any interest. For convenience, save it in the Savings banks atleast for emergency purposes. Almost all banks will provide card transactions. I know some charge some amount but a small talk with higher management, this is generally waived off. Hi, I tried but currently they are not accepting Indian currency anywhere In UK, no banks/Exchange services are accepting Rs 500 and Rs 1000. Please advice where should I go / what to do….I don’t have any travel plans to India before Mar 2017? Please mail me the latest information regarding this. PLEASE CONTACT US 9990764600 IT’S MY INDIA NO. Your best bet is to give it to some people who are travelling back before End December. As per the law, you shouldn’t have more than Rs 7500 since that’s the maximum a person can carry out of India in cash. All those who have 2 or 3 lakhs at home as many years of household savings have already lost a good chunk of the money due to inflation. If at all it was accumulated atleast in a savings account, they would have grown it by 4% every year. Looks like the need of the hour is teach the importance of a bank account not just today but for life. Its very hard to believe people withdrew 90% of the salary from their bank account every month for monthly expenses even though they already have 1 or 2 lakhs at home. Lets see what taxmen say about this. Dear Sangita…One of my friends who is in HongKong had high denomination notes worth around Rs 30k, she could exchange them at local Money transfer agency. So, kindly check if this is possible in your case too?? If the only source of income for is from Agriculture then such income is not taxable. If you receive any compliance notice, you may have to justify your stand. 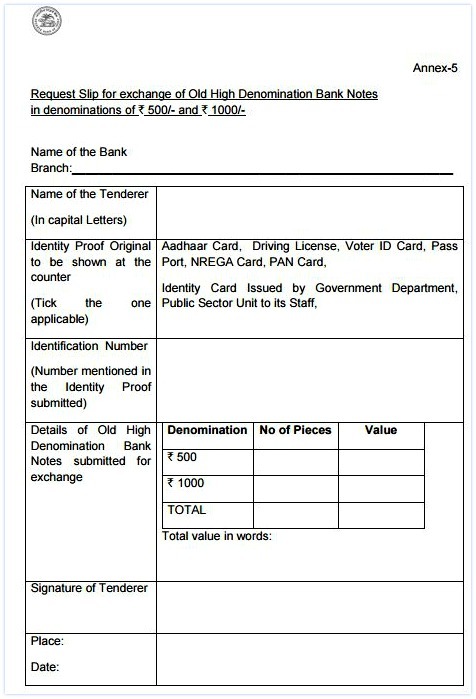 How Exchange of OHD for Rs 4,000/- in several bank branches against identity proof of voter id as one of the required proof will link all entries of cash deposits within permitted 50 days to threshold limit of Rs 2,50,000/- in absence of PAN nos ? And if suppose this threshold limit is crossed & Rs 1 crores is got exchanged within 50 days, how Income Tax Dept will come to know that this threshold limit of deposit of Rs 2,50,000/- has been crossed in a certain case for want of PAN identity which was not strictly required & voter id proof was enough as identity for exchange ? Policy makers have left this glaring loophole & how can they claim of effective action against black money ? If one has PAN and do not provide it while depositing can be tracked, as RBI has sought daily reports with details of Account holder name, account number, amount deposited, id proof etc. If he/she is a tax assessee then it is all the more easy for the IT dept to track, as account numbers & Aadhar card are captured through ITR. If one does have PAN at all, then it can be possible provided that he/she does not deposit more than Rs 50k at one shot, as for deposit more than Rs 50k, banks insist on PAN. I was referring those people using only identity like voter id (except PAN cards) against exchanging Rs 4,000 from several branches within 50 days, because PAN is strictly not the only requirement for id. Just read it on Economic Times portal that ‘exchange’ of Rs 4,000 is only allowed per person only one time till Nov 22nd. You may go through this article, click here.. Yes, agree with you. It has been misused and the Govt. realized it and introduced “Ink”. If it was done from Day-1 then it could have been a huge success. Since last 5 years, I am working for a PSU and every month i withdraw 80 to 90 % of my salary from my salary account through cheques and keep that cash money in home for expenses. Now thing is due to this practice , this cash is more than 5 lakhs and Govt. is saying that after 2.5 lakh you can be taxed or penalized and i am worried, why i have to pay any tax or penalty on already tax deducted money. The money withdrawn was the salary paid by my employer after deducting income tax and every year i file ITR, i am little worried because i am not good with income tax rules and after PM’s speech , every day i hear new information. It is my hard earned tax paid money. request you to kindly enlighten me in simple income tax rules and how i should deposit this money in my salary account. I believe most of them will belong to this scenario. People would have drawn there 70 to 80% monthly income and invested in chit funds from a long time and now definitely they would have accumulated more than 2.5 lakhs in there hand and now our concern is how to exchange those high valued denoms by without paying further taxes. If I am not wrong, the worry is of the Chit fund managers. If you haven’t withdrawn your money from the chit fund, do not withdraw now, wait until next year where the payment will be made in new currency. You may then decide how to put the money back in the banks. We never know whether that chit fund company/manager will exist till next year. If the accumulated cash is through the legitimate sources (it is, in your case), kindly do not worry! If you have accounted for the money in your ITRs, it should not be any issue to deposit more than Rs 2.5 L.
How to mention or declare the cash withdrawn in last 4 years as we do not have option to mention this in ITRs, in that case do Income tax dept. treat this cash as Black amount or it is like once i have declared and tax has been deducted i can do any thing with that money (yes any gain will be taxable). I am not able to picturize, if i deposit all this cash how income tax dept. assess this cash i.e. black or white on what basis ? The main point here is ‘disproportionate‘ levels of income. Illustration – Any person deposit cash in his/her accounts which was disproportionate to his/her income (cases of disproportionate cash may be as under assesseee has never furnished return of income or furnished income but has shown income below taxable limit and deposit cash 2.50 lakh or more in his/her bank account by 30th December 2016, or has furnished income which is above taxable limit say 10 lakh and deposit 20 lakh in his bank account) in such a case assessing officer may serve him/her a notice under the Act and ask him to give sources of such cash/income. Kindly note that ‘serving notice’ does not mean that penalty is levied, it can be just a compliance notice for which the tax assessee has to reply. How Income Tax dept tracks high value financial transactions? e-Sahyog : New Online Facility to resolve ‘Income Tax Returns’ mismatch issues. Total expenses in last 5 years = Total money withdrawn in last 5 years – the Cash in hand now. The expenses should look reasonable for 5 Years. If you would like to calculate your income tax liability then kindly, visit this link..click here..
Read this article, can be useful to you : List of income tax exemptions for AY 2017-18. What about the black money kept in Swiss bank?. I think the money kept in Swiss bank are in converted form of dollar. Why are you worried about it ? Hello sir we are getting sms from our banks we dont need to worry and we are allowed to deposite as much amount as you have. In this case what if any house wife have money more than 2.5 lakhs (those are saving monthly, got as gifts from relatives, or saved by selling her gold etc) in her hand ? As per the sources – Deposits of around Rs 2 Lakh will not be questioned by the IT dept. If you are not in need of this money, you may deposit after the 50 day window period. Kindly do not worry, if this is your legitimate money. A.1: Such group of people as mentioned in the question need not worry about such small amount of deposits up to Rs.1.5 or 2 lacs, since it would be below the taxable income. There will be no harassment by Income Tax Department for such small deposits made. Q.2: Will the Income Tax Department be getting reports of cash deposits made during this period? If so, will the current threshold of reporting requirement of reporting cash deposits of more than Rs.10 lacs will only continue? A.2: We would be getting reports of all cash deposited during the period of 10th November to 30th December,2016 above a threshold of Rs. 2.5 lacs in every account. The department would do matching of this with income returns filled by the depositors. And suitable action may follow. Q.3: Suppose the department finds that huge amount of cash above Rs.10 lacs is deposited in a bank account, which is not matching with the income declared, what would be the tax and penalty to be paid on the same? Q.4: It is believed that a lot of people are buying jewelry now, how does department plan to tackle this? A.4: The person who buys jewelry has to give his PAN number. We are issuing instructions to the field authorities to check with all the jewelers to ensure that this requirement is not compromised. Action will be taken against those jewelers who fail to take PAN numbers from such buyers. When the cash deposits of the jewelers would be scrutinized against the sales made, whether they have taken the PAN number of the buyer or not will also be checked. Just want to share my view on you case. And its purely my analysis and assumptions. so please correct me if any one have other points. I am sure this is the correct time to transfer money from foreign currency to Indian currency. As this step will surely increase Indian currency value in very short time. Dear Amit..i am not sure about this one. Kindly check with your banker. Q – I am an NRI and hold NRO account, can the exchange value be deposited in my account? Ans – Yes, you can deposit the OHD banknotes to your NRO account. I think, by this time u have had a solution. but if not, then u may contact me. I will advise u in details. You can deposit in the NRO account and keep the transaction of the NRE account handy when you made the transfer of the Foreign money into NRE. As there is no tax on the income earned outside India, you should not be subjected to tax. If there is a auditing, you can submit this as valid proof. Thank you dear Manja for sharing your valuable inputs. Very good points Sreekanth. A complete article. I was looking for this. Thanks. And also I very much agree with your personal thoughts on this matter. Our ancestors fought for our freedom, we can at-least stand on the bank queue. The effect of this move will definitely create short term tension & panic among people. But one need to understand that to get something good, we have to suffer little bit. I think everyone want a strong & stable economy, stop corruption in our country and to achieve that it need such bold step only. Thank you dear Santanu for stopping by and leaving your comment. Thank you for updating us with this new announcement. This is a great step taken by our government against black money. Although we will face some issue regarding cash shortage as bank and ATM will be closed for two days but this is still in the favour of common man who is working hard to earn money. I appreciate Modi Ji for implementing this. Dear Kalpana..As opined by you, we all may face some hardships in the next few days or weeks, but let’s remember the idiom ‘no pains, no gains’. Thanks for the comment! Just got a call from friends on a long distance train saying that they’ve not been able to eat for 2 days since their 500 buck notes are useless as IRCTC is not accepting them. So these are people who’ve been made hungry by the government. So it’s the common man – travelers, senior citizens, maids, drivers etc, who have been mostly hit by this. This is essentially an effort to divert attention from the mess the government has been creating and also an attempt to hit other political parties during the Punjab and UP elections. A clever move indeed.